I hope you had a good start to the new year. Isn’t it a nice thought that at the beginning of a new year everything is allowed to start fresh and you can let yourself forget about past mistakes and sorrows and just start anew? We just got back from a week of skiing in St. Anton, Austria, which was an excellent way to start off the new year. As always when travelling I get so inspired and uplifted, and this time probably even more so owing to the persistent rain in Scandinavia over Christmas. It was such delight to see the mountains, the snow, to get plenty of exercise and to breathe the fresh alpine air. And to have soup. Nothing tastes better after a day of skiing, and let me tell you Austria is a heaven for soup lovers. No meal starts without it. I am not so impressed in general with the Austrian kitchen. It’s a bit on the heavy side for my tastes. But the soups are delicious. 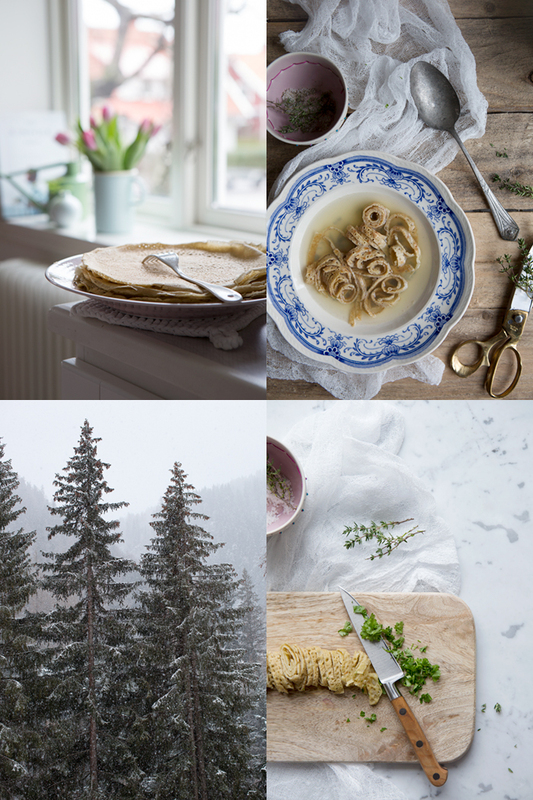 Frittatensuppe is traditionally a home made beef broth (or consommé) topped with rolled up and then thinly sliced strips of pancake. And I was inspired to go home and make a vegetarian version – with healthier pancakes. And I chose to make the pancakes both dairy and gluten free. This dish may even become a weekday “go-to” meal for the entire family. You can of course, if you like, make this on store-bought broth. But every time I make vegetable broth from scratch I wonder why I ever bother buying it in the store. It is so easy. Just chop up some vegetables, sweat them in olive oil, cover with water and simmer for an our, strain and serve. Or freeze in containers for later use. This is a really fresh dish to start the new year. Something you can make over and over and with different toppings (or different broths) throughout the winter. I hope you like it as much as we do! 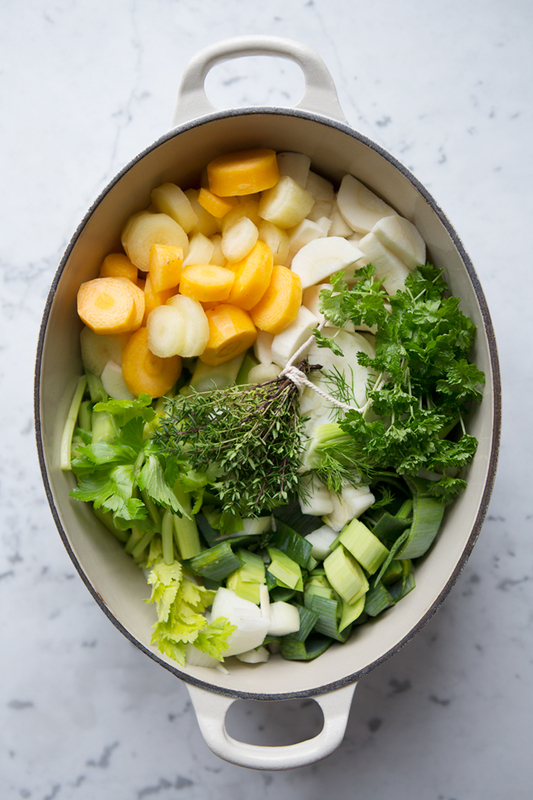 You can make broth using any amount of vegetables that you happen to have on-hand, but it’s good to have a roughly equal portion of each so the result will have a balanced flavor. And the amount of water doesn’t really matter. Less water makes your stock more concentrated, while more water makes a lighter-flavored stock. Here’s what I used this time. 1) Wash any visible dirt off the vegetables (peel the roots if you like) and chop them up roughly. Sweat the vegetables in a small amount of olive oil on low heat for about 6-7 minutes. This step can be skipped, but it does release more flavour. 2) Cover the vegetables with water. But not too much – make sure there’s enough room so you can easily stir them in the pot. Bring the pot to just under a boil. Once you start to see some bubbling around the edges of the pot, turn the heat down to medium-low and simmer for about an hour. Just give it a good stir every now and then. 3) Take the pot off the stove and remove all the vegetables with a slotted spoon. Set your strainer over a big bowl and line it with cheese cloth or coffee filters. Pour the broth through. 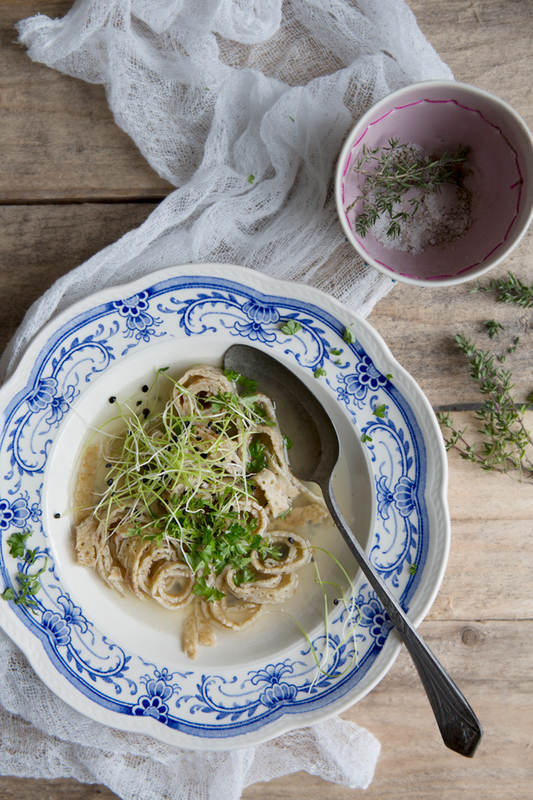 4) Season the broth with salt and pepper and serve with finely sliced buckwheat pancakes. 1) In a large mixing bowl mix all ingredients and whisk until you have a smooth batter. 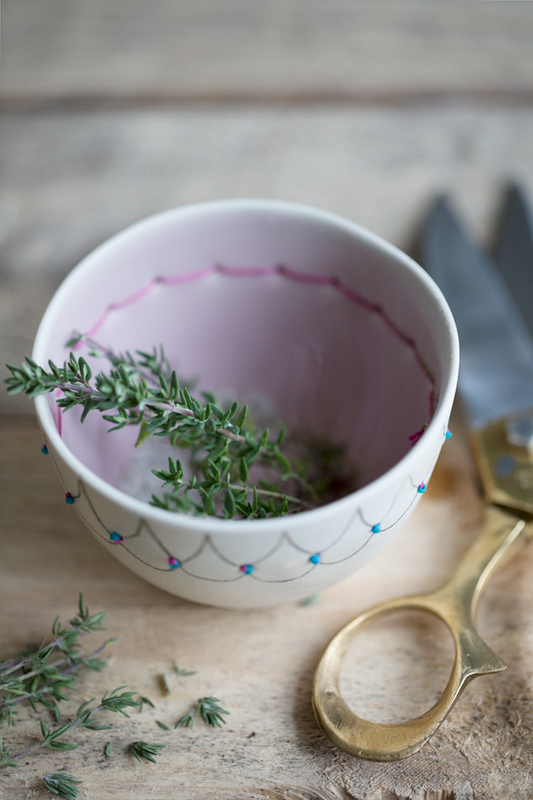 2) Cover the bowl with cling film and place in the fridge for at least 30 minutes. Give the batter a good whisk before frying the pancakes as the flour tends to sink to the bottom. 3) Heat a non-stick pan or an oiled pancake skillet and fry the pancakes on medium-high heat. 4) Place the pancakes on a plate to cool and when ready to serve with the broth, just roll them up and slice very thin strips. 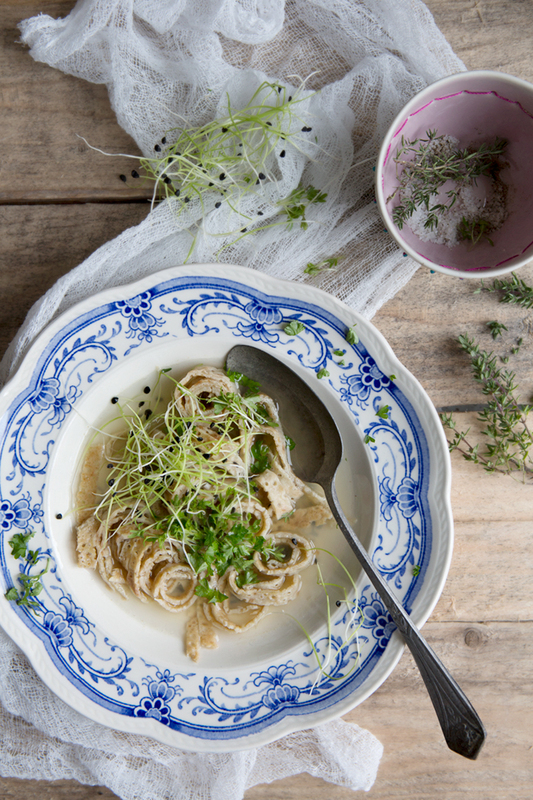 Serve the broth with the thinly sliced pancake strips, parsley, sprouts, garden cress or whatever you have at hand that tastes good and looks good! 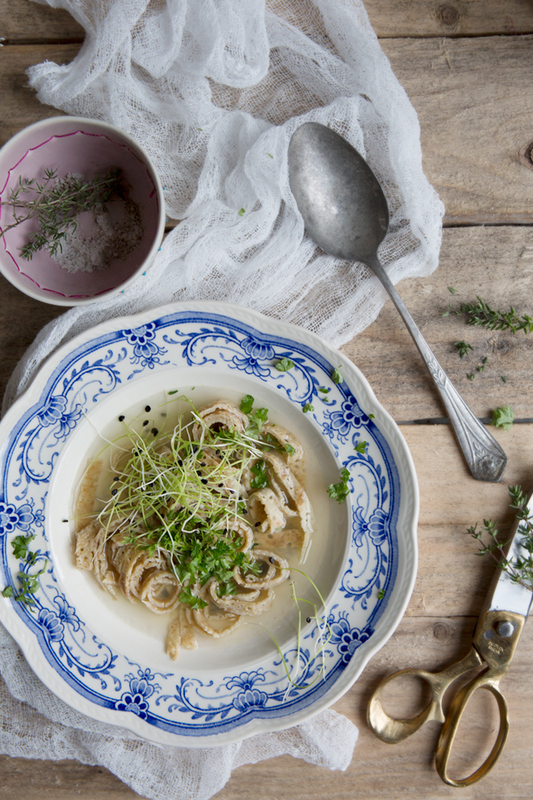 My Bavarian Oma used to make this soup too but in Southern Germany it’s called Flädlesuppe. We still make it if we happen to have some leftover crêpes. Such a comforting dish. Sini – thanks for sharing! So interesting to hear stories about food and how their names differ in different regions. It is very comforting for sure! Karin – samma här, älskar asiatiska smaker och särskilt koriander och ingefära!